This is one of those books that are good when you first read them, but get better as you get older. A lot of satire is probably like that, especially comic satire. I thought this book was funny in 2009, but now parts of it made me laugh so hard I was crying. Plus, I did the audio this time, and it made it even better. Martin Jarvis has a nice sense of comic timing, and his voice characterization is great, particularly for Crowley and Aziraphale. (The scene where they are drunk and discussing the universe was so good out loud!) He also chooses to give Adam this deep, serious voice that is wonderfully at odds with him being an angelic eleven year old, but creepily in line with him being the Antichrist. Basically, Crowley and Aziraphale are supposed to be on opposite sides of Ye Eternal Battle, but they both like the world so much, they decide, what can it hurt to try and save it? But things have already been messed up because a Satanic nun mixed up the baby switching, and now the Antichrist is called Adam and being raised in the English countryside, and he likes the world pretty well, too, as it turns out. 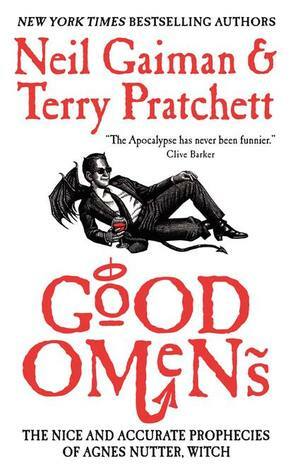 I can no more review this book than I can any of Pratchett’s books (I have a hard time with Gaiman as well, funnily enough). The point seems so clear when I’m reading, and then I try to sum it up, and there’s nothing there but the remnants of my glee. 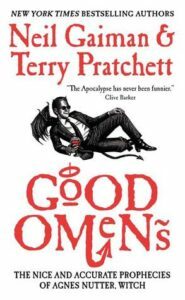 I’m really glad I read this before the miniseries comes out, but I confess, I found myself easily picturing David Tennant and Michael Sheen as Crowley and Aziraphale, and I’m super excited to see how it turns out.